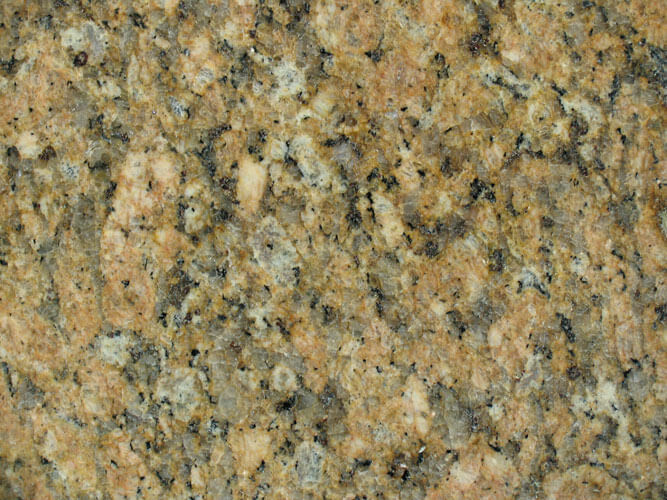 There are plethora of popular granite colors available, that’s for sure. What’s popular in one area of the country may not be popular in another. Add to that the problem that different companies don’t always call the specific colors by the same name, you can see why coming up with a definitive list of the most popular granite colors would be difficult to do. What I can do however, is come up with a list that my clients have used more than others. One color that is especially popular when paired with oak, maple or other light wood cabinets is Giallo Veneziano. Also known as Amarelo Veneciano and Cinnamon Sand among others, Giallo Veneziano characteristic colors are gold, red and black. Some slabs may lean more towards a pink hue it just depends on where it is mined. The pink hue Giallo Veneziano works really well with golden oak cabinets, while the golden hue would look better with a maple or beech cabinet choice. Another popular color is Labrador black granite. This color can also be referred to as Labrador green or Brazilian green granite. This color is popular because it’s dark and dramatic, but is not solid black. It has specks of dark green, black and gold. This color is popular with both light color kitchen cabinets and darker ones. When compared with lighter color cabinets Labrador green looks stunning against Maple because the gold specks are more noticeable against the golden tones in the cabinets. Where as, when compared with a darker wood like cherry the dark greens really stand out and create a dramatic contrast. Absolute black granite is also very popular because it is blends well with multiple surfaces. Absolute black granite is one of the most boring granites as far as pattern but that is also why it draws a person’s attention. It has a just a little bit of pattern going on without all the distraction of a typical granite. It can go with just about any color cabinet and is great for both traditional and contemporary designs. Ivory brown also know as Shivakashi Brown is a lighter color granite that is growing in popularity. It has more of a creamy base color and is characterized by dark browns and golden hues. Ivory brown looks great on darker colored cabinets, especially if you are looking for a contrast. It may not be as immediately stunning as the darker colors but it is easier to keep clean and one of my personal favorites. This list summarizes the most popular colors my clients have purchased in recent months. What works for you in your own kitchen, may be completely different. One point to consider before you choose your granite color is that each piece of granite is uniquely different from the previous one. So don’t expect the piece that your countertop comes from to look exactly like the piece on display. If your granite dealer allows it, go to the warehouse and pick out your slab personally. This way you will have a better idea of how it looks before it’s brought into your home and you have any potential problems.